Photo: Eden Plantation house, possibly built ca. 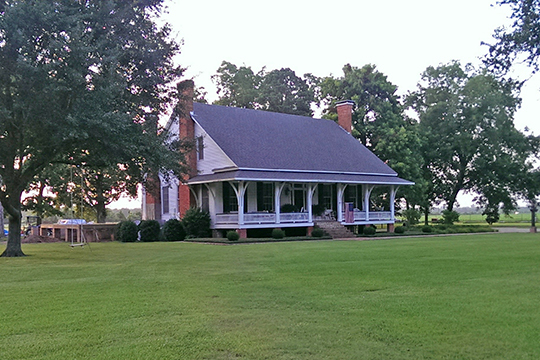 1830 by Pleasant H. Hunter, Louisiana Highway 121, Gardner, LA. Listed on the National Register of Historic Places in 1984. Photographed by user:Yellow69z28rs (own work), 2014, [cc-by-3.0 (creativecommons.org/licenses/by/3.0)], via Wikimedia Commons, accessed December, 2015. Rapides Parish administrative offices are located at 701 Murray Street, Alexandria, LA 71301; phone: 318-473-8153. An early settler, Alexander Fulton, laid out the future city of Alexandria (Rapides Parish Seat) in 1805 having received a Spanish land grant in the 1790s. The parish itself was originally organized in 1807, prior to Louisiana becoming a State, under authority of the U.S. Territory of Orleans, which was part of the Louisiana Purchase. The Parish is named for the Rapids along the Red River. [en.wikipedia.org, accessed December, 2015].